Residents of Ifiekporo in Warri South Local Government Area of Delta State had to climb trees and change position in toilets to make and receive phone calls because of very bad telecommunication network and data connectivity. Sunday Vanguard learned that inhabitants of the community had resigned to fate until former Governor Emmanuel Uduaghan intervened and got the owner of Globacom, Chief Mike Adenuga, to break the five-year-old problem. Acting President of Ifiekporo Graduates Association, Monoyo Edon, who confirmed the predicament of his kinsmen, said, “The agony of poor mobile network and data connectivity, which had been haunting indigenes and residents of Ifiekporo community, joint host to NNPC Refinery, Seplat, Chevron and sole host to a cluster of tank farms, has been resolved by the All Progressives Congress, APC, senatorial candidate for Delta South, Dr Emmanuel Uduaghan, who facilitated the revamping of an abandoned and uninstalled Glo network mast in the area. Edon went on, “It was a very frustrating experience for every resident of Ifie. Like others, he (Uduaghan) did not believe that we had made countless fruitless efforts to have as simple as a mast in the community for five years. He asked me to remind him to put a call through to Chief Mike Adenuga because our case had gone beyond Warri and Delta State. “Ordinarily, this should not have been news, but just like a barren woman who finally gives birth after 20 years and throws a lavish child delivery party, not dedication, we in Ifiekporo cannot hide our joy and gratitude to the former governor for the huge role he played in ensuring that our community is connected to the rest of the world”. Narrating how the community lacked telecommunication facilities for about half a decade, he said, “Five years ago, Globacom Nigeria secured a space in Ifie to mount one of their network masts. MTN and Airtel followed suit, but it was only Glo that succeeded in mounting just a pole. “The news of this development and the tank farms springing up in the area attracted a lot of people to the community. Curiously, no word from the telecoms giants on when they would build their masts. “Three months became six months, one year and later two years. By the third year, it became evidently clear that the telecom giants had all abandoned the community. Indigenes, elders, youth association executive members, concerned residents and even some officials of the tank farms all approached the network providers to site their masts in Ifie, but all efforts seemed to have hit brick walls. “By the fourth year, I personally went on a plea mission to the Warri offices of all of the telecom giants which had made previous attempt to site their masts. It was in Glo office that I learnt the reason they fled my community. “At the beginning of 2018, the fifth year, our case had become a core hopeless situation. Some residents and small medium enterprises (SMEs) were moving out of the community. “Since the construction of the Trans Ode-Itsekiri Access Roads and Bridge project, Ifie had transformed from an ancient community to an industrial hub and a serene residential area. “Companies are still securing spaces or buying spaces from other companies to site their properties. Yet, in all of these, it seems principalities had resolved not to allow smooth mobile and data connection in the community. 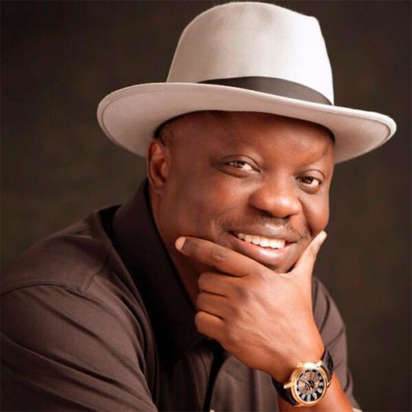 “I thank God that by the time I started working with Dr. Emmanuel Eweta Uduaghan, I was living in Ifie with my wife who had threatened to leave me in my ‘network less village’ to rent a small apartment in Warri so as to enjoy the ‘civilization’ she was enjoying in Lagos before she relocated to join me in Warri (Ifie precisely). “In May, the opportunity presented itself at a function in Lagos. As I saw Chief Adenuga, I reminded my boss, who did not hesitate to bring the matter to his knowledge. Chief sent me to the Alhaji in charge of nationwide operations to explain how a simple mast had eluded an industrial community. “Immediately, they deployed a full complement of engineers to Abigborodo (Uduaghan’s hometown in Warri North local government area). Alhaji called His Excellency that there was Glo mast in his community. His Excellency had to tell them that it was his other community in Warri South. “Oga asked them to deal with me thenceforth. Alhaji ordered the regional headquarters to get the Warri office to map the area. Warri office told them that their record showed there was an existing and fully operational mast in Ifie, but I told Alhaji that they had abandoned the mast and it was not yet installed. “This angered Alhaji who almost sacked the Warri Office head but said the mast would be installed and fully operational within three days. “You needed to see the joy in my face the first day I took delivery of the major equipment at the site. Virtually all the families in the community switched to Glo”.